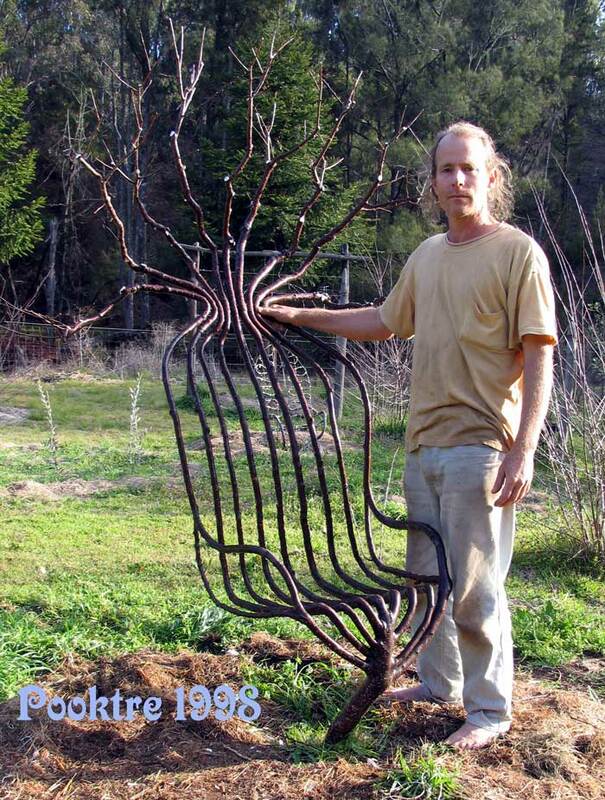 Pooktre Tree Shaping: It’s Unlike Anything You’ve Ever Seen! Pooktre tree shaping is a unique eco-art form created, developed and perfected by Peter Cook and Becky Northey in South East Queensland, Australia. As seen in these photos, Pooktre is a dream made into a reality through inspiration, love of nature, tree finesse, persistence and understanding trees and how they grow. 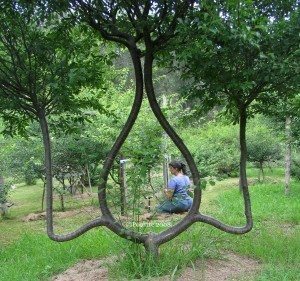 Now if I am going to write an article about Pooktre, I’ve got to mention one of the masters of tree shaping: Axel N. Erlandson (1884-1964). 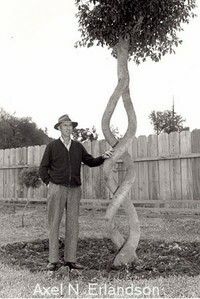 Erlandson put himself on the map, literally and figuratively, by creating a roadside horticulture attraction he dubbed The Tree Circus in Scotts Valley, California back in 1947. Erlandson had a vision of a horticulture theme park and charged admission but it was never a commercial success. The Tree Circus took in just over $300 for the entire year of 1955 — his biggest take. He sold the property in 1963 for $12K and died the next year. Property owners came and went over the years. Finally, in 1985, the owner of a tree nursery bought 24 of the trees from the previous owner and transplanted them to his horticulture theme park, Gilroy Gardens in Gilroy, California and they are on display today. Some of Erlandson’s other trees were sold and eventually ended up at The Museum of Art and History in Santa Cruz, California and in Baltimore at the American Visionary Art Museum. Grow Your Own Furniture… Really! Now, 50-plus years after Erlandson’s Tree Circus opened for business, Pooktre co-founder Pete Cook proudly stands next to one of his guided creations on his home turf in South East Queensland, Australia. Pete has some very cool looking Pooktre growing out back! His life partner, Becky, co-founded Pooktre back in 1996. We evolved our techniques of shaping trees in complete isolation from the rest of the world. With our techniques we know what will work or not and we can reproduce any of our pieces. Which we have done with our favorites. Pooktre only relates to our techniques, in short we have mastered the art of Pooktre. One very important thing that I have learned is that Pooktre is NOT arborsculpture. Arborsculpture does not translate well in Japanese. 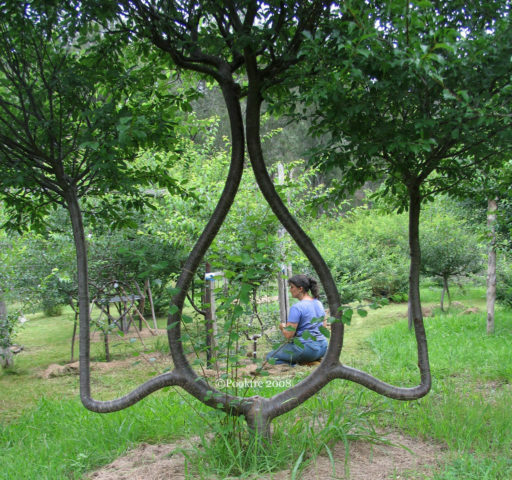 In Japanese arborsculpture means to carve away, not shape. And Pooktre is all about tree shaping, not carving. This is helpful information they picked up while in Japan at the World Expo 2005. 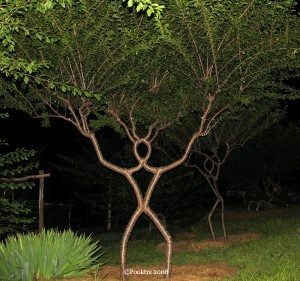 John Gathright, the producer of the Growing Village at the Japan’s World Expo 2005, asked if we wished to have the whole art form called Pooktre or Circus Trees. We felt that as Axel N. Erlandson had done his trees first and well, that we were happy to have our trees associated with his. So in Japan at the Expo the trees were called Circus trees. 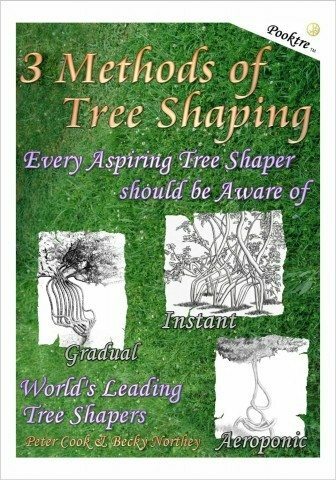 We are quite happy to have our trees associated with people that have mastered their art. 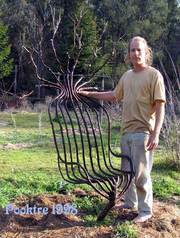 One example: John Krubsack, who grew a chair on his first try or with Chris Cattle, who has mastered the way he shapes the trees and is able to reproduce the same design again and again. Which means he has a understanding of how and why the design works. You can see more of their work that was featured at the 2005 World Expo in Aichi, Japan. 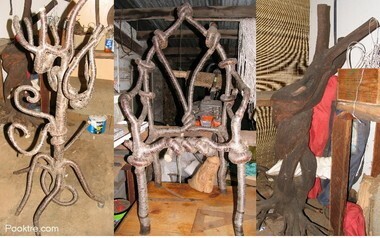 A hat stand and a few special carvings (above). More Pooktre creations below. Notice in the photo directly above that they have inserted a custom-cut piece of stained glass within the tree itself where it has become a part of the tree. Simply amazing! The above photo features Pete’s Pooktre Night Men. I’m in! Publishing a book showing how this is done is a gateway for green thumbs around the globe to do something special in their own backyard — or at least make an attempt at it. Here’s how to do Arborsculpture yourself. It’s a fun hobby!